Twenty years ago a great crime was committed that has still not been resolved. In the early morning hours of July 13, 1994 thirty seven men, women, and children were killed by government agents as they sought to travel to freedom on board of the “13 de Marzo” tugboat seven miles off the Cuban coast. Eleven of these Cubans were children ranging in age from Helen Martínez Enríquez, just five months old to Mayulis Méndez Tacaronte age seventeen. The Inter-American Commission on Human Rights in a report released on October 16, 1996 concluded that what transpired that early morning “was not an accident but rather a premeditated, intentional act” by agents of the Cuban government and held the Cuban State responsible for violating the right to life of all the people who were shipwrecked and perished as a result of the sinking of the tug "13 de Marzo", which events occurred seven miles off the Cuban coast on July 13, 1994. 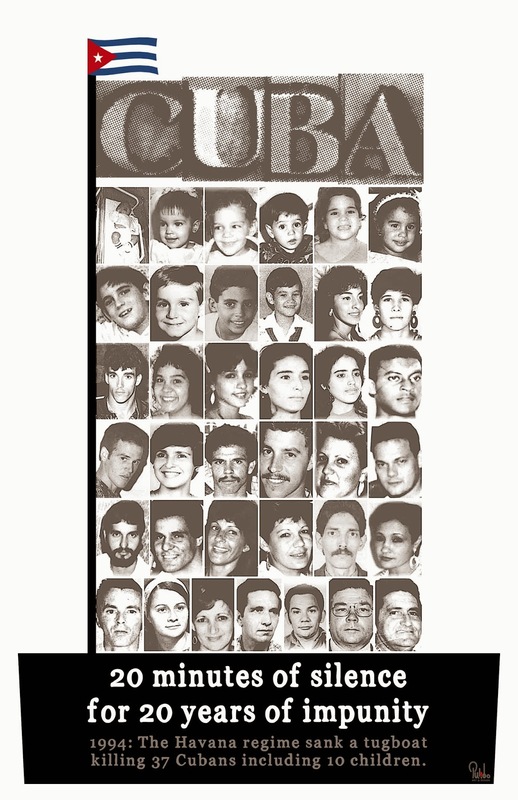 Twenty years later, the men responsible for the mass murder remain at large and protected by the Cuban state and the survivors and family members have faced persecution, harassment, death threats, and arbitrary detentions for speaking out. 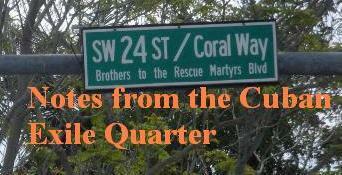 In 2009 one of these family members, Jorge Garcia, agreed to address Florida International University students at a panel organized by the Free Cuba Foundation on the fifteenth anniversary of the July 13, 1994 “13 de Marzo” tugboat massacre. Prior to the event we met and he sat down and he explained on camera what had transpired before, during and after the events of July 13, 1994. Jorge Garcia is a man who has suffered a loss few can imagine. In a January 1998 Nightline interview Jorge described how he learned the news. “When I asked my daughter, ‘What about Juan Mario?’ ‘Papa, he's lost.’ ‘And Joel?’ ‘Papa, he's lost.’ ‘And Ernesto?’ ‘Papa, he's lost.’ And then we knew that other members of the family were all lost, 14 in all.” His daughter, Maria Victoria Garcia, had survived but she lost her brother, Joel García Suárez age 24; her husband, Ernesto Alfonso Loureiro age 25; and her son, Juan Mario Gutiérrez García age 10. Father and daughter had spoken on camera to Nightline from Havana, Cuba about the July 13, 1994 attack on the “13 de Marzo” tugboat. A year later in 1999 they had to go into exile as political refugees fearing for their lives. Twenty years later the remains of the thirty seven victims have not been recovered and returned to their families. Nor has the state provided any compensation to the survivors or the families of the dead. On Saturday, July 12 Jorge Garcia took part in a flotilla organized by the Democracy Movement ( Movimento Democracia ) that got within 12 miles of the coastline of Cuba and five miles from the spot that 20 years later still serves as a watery grave for fourteen family members including his son and grandson. This is as close as he can get to pay his respects to his loved ones. On Sunday, July 13 at 3:00pm at Florida International University with members of the Free Cuba Foundation I took part in a 20 minute moment of silence to protest these 20 years of injustice and pray that a serious investigation finally be conducted, that the remains of the victims be returned to their families, and that the individuals responsible for this atrocity face justice in a fair trial with their rights respected in a court of law. In the meanwhile let us pray for the 37 murdered 20 years ago and the eleven children who never had a chance to grow up and live full lives in freedom and that they and their loved ones may one day have justice.